This is a review specifically for WebHostingPad’s WordPress Optimized hosting. If you would like to read WebHostingPad’s shared hosting review please Click Here. WebHostingPad, while a bit late to the game, has recently started offering WordPress Optimized hosting for those customers looking for a more WordPress specific web hosting option. Starting at $2.99/month, customers can have their WordPress websites hosted with WebHostingPad on a completely unique set of servers that are optimized for WordPress. For the past few months I’ve been testing their WordPress platform and, in short, I’m pretty impressed. As is the standard with WebHostingPad, their WordPress hosting is significantly cheaper than the competition. Compare them with HostGator, for example, who’s plans start at $5.97/month and renew at a pretty ridiculous $12.95/month. WebHostingPad’s servers run proprietary malware scanners that catch any virus files that are uploaded and automatically removes them from accounts. Also included is access to over 75 professional WordPress themes which is a great alternative to the free, insecure themes that many people are drawn to. They also offer a full, WordPress customized cPanel which means you can still run your account like you’re used to. WebHostingPad really has put a lot of thought into their WordPress package, and it shows. 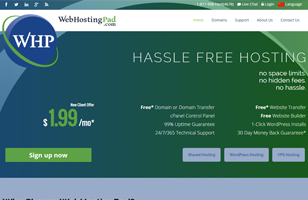 Like I outlined above, WebHostingPad is, first and foremost, an inexpensive host. Their WordPress hosting is no exception. They offer three different packages based on your individual needs, and prices range from $2.99/mo for their WP Basic package all the way up to $5.99/mo for the WP Premium plan. Comparing this with other WordPress plans shows that WebHostingPad is all about value for money. This is where WebHostingPad’s WordPress hosting really stands out from other WordPress hosts. Most other web hosting companies that offer WordPress hosting are doing one of two things. The first thing they do is simply add the word “WordPress” to their normal hosting packages but don’t do anything to actually make the service more WordPress friendly. The other thing many hosts will do is limit your accessibility to the hosting account so that you don’t have complete control over what you’re trying to do. WebHostingPad does neither of these. They offer a fully accessible, WordPress Optimized environment. All of their WordPress plans are on servers that only host WordPress hosting accounts. This allows them to optimize the servers to run WordPress websites only as opposed to trying to cater to a wider range of content management systems. These servers include an automated malware scanner and quarantine system, SSD drives for faster loading times, and other premium WordPress services. They also give you complete access to cPanel control panel, something other WordPress hosting packages (like HostGator) don’t offer. This allows you to manage your whole hosting account in a user friendly, familiar environment. You might expect your performance to be lacking because of how inexpensive WebHostingPad is, but that couldn’t be further from the truth. WebHostingPad’s servers are stable and reliable. After a 7 month test my website had a total up time of 99.942%, which is above their 99.9% guarantee. Server response time is fast and my websites loaded quicker than on competitors servers. This is just a guess, but my assumption as to why the server speed was quicker than other hosting companies is due to the lack of the additional features on every account. Having these features running in the background on every account on a server causes more resources to be used on the back end, which in turn leaves less of those resources to be used on website functionality. Again, just a guess, but it makes sense to me. WebHostingPad does offer pretty good support, and if you opt for the highest plan (Premium) you will get WordPress Expert help. While I did not test this plan (I didn’t want to pay the extra), the sales representatives informed me that the WordPress Expert help assists with all things WordPress, from theme and plugin installation and setup to debugging and coding issues. This could be very valuable for people who aren’t tech savvy enough to solve these issues themselves. WebHostingPad’s WordPress Optimized hosting is the best WordPress specific hosting plan I’ve come across. Their attention to detail in making a package that helps WordPress websites run is pretty great, especially at such a low price. They are hands down my #1 pick for WordPress hosting.